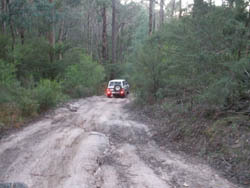 S6 Track runs off Mount Carmel Road near the end of B6 Track and continues through to join up with Ortons Road and then back out onto Moe - Rawson Road. This track has some semi steep ascents and descents and several rutted areas, nothing too extreme though. Plenty of other tracks leading from this one which look good. Overall, a medium track, only because it was wet, would be close to easy in the dry ( or daylight ).